This graveyard located in Singapore is comprised of three separate burial grounds collectively known as Jalan Kubor Cemetery. 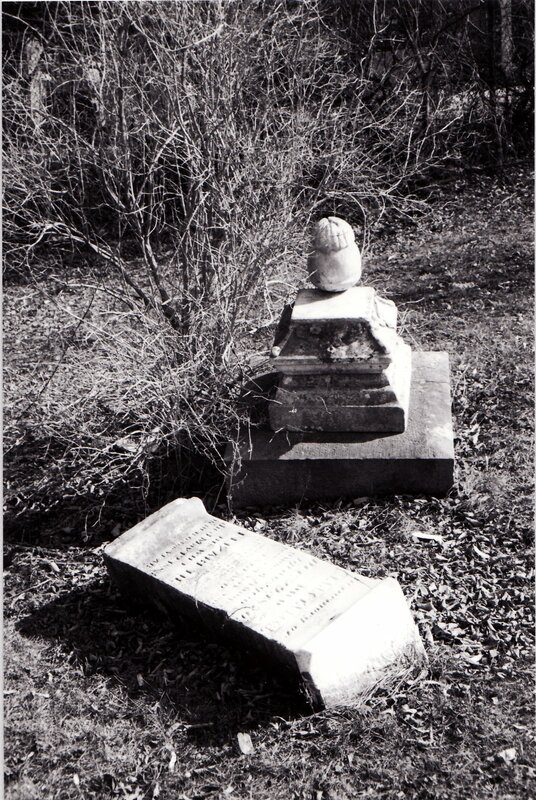 Within the cemetery there are tombs, stone and wooden gravestones. Many graves are topped with coloured cloth – yellow denotes Royalty and green represents Islam. The burial ground known as the Tombs of Malayan Princes on Victoria Street was reserved for the royal household of Sultan Hussein. There are many raised tombs denoting royal graves. It was also known as the Sultan’s Burial Ground although he is buried in Malacca, and in fact, anyone could be buried there which resulted in it being packed with graves. The Malay Burial Ground also located on Victoria Street near the Rochor Canal is commonly known as Syed Omar’s burial ground. The Indian Muslim Burial Ground surrounded by a wall is located at the junction of Victoria Street and Jalan Sultan. This plot of land was originally donated to the Indian Muslims residing in Kampong Glam for use as a burial ground. However, it became popular with Bugis and Banjar merchants. Inscriptions on stones are in Bugis script, Arabic, Chinese, English, Jawi and early forms of Malay. Wooden markers – we can’t really call them gravestones or headstones when they are made of wood – were initially used due to availability and low expense. However, the wood which deteriorated rather quickly due to weather conditions was also subject to forest fires. Friedrich Glauser Schrefleller was a Swiss native and a celebrated writer in the German language. For most of his brief time on earth (1896-1938) he was addicted to opium, and on the evening prior to his wedding he suffered a stroke and died two days later. Charles Morgan Blessing, a miner, was shot in the head and robbed by Hames Barry who was hanged as a result of this crime. The murder took place in Cariboo, British Columbia, Canada. In memory of C. M. Blessing, a native of Ohio, aged 30 years was murdered near this spot May 31 1866. This wooden grave marker circa 1850 is located on a steep hillside near Virginia City, Nevada. The graves located there are host to people from varied social and economic status and as a result, the grave markers within the Silver Terrace Cemeteries are made from a variety of wood, metal and stone. 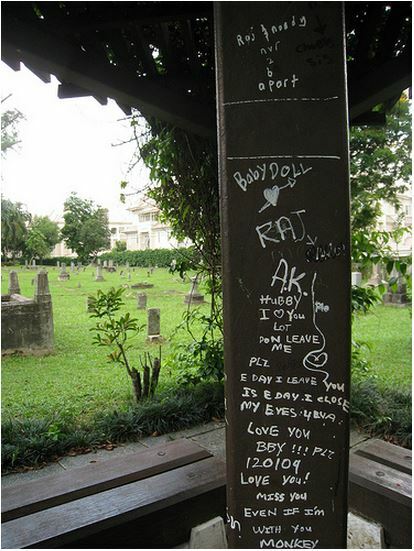 A tired and worn marker situated in the old Malay Cemetery in Singapore. During WWI, A.I.F. Private Frank Gallagher, age 23, was killed on 23 August 1918. A wooden battalion cross was erected at the site of his death; Bray-sur-Somme. A photograph of the wooden cross has been modified by Frank’s mother by pasting a photo of Frank in uniform. Jason Hayes who died when he was 74 is buried in Barnet, Georgia. The Horváth family from the Almad Forest in Transylvania, are identified with a wooden marker in the Kecskemét Reformed Cemetery, Bács-Kiskun County, Hungary. The marker is engraved with the name Karolyne Horváth who died on 4 March 1930 and Dr. Karoly Horváth who was born in 1873 and died in 1943. The partial image of a wooden marker is worn and broken. In the centre of the marker is a circle containing a form of four Tau crosses. The Tau is one of the oldest forms of a cross, believed to have been held by Moses in the wilderness. On the right of the photograph is a worn engraving: a circle divided into 8 sections. This could be a symbol for God or Holy Spirit. Graffiti and vandalism seem to be a peculiarity of youth; can’t say I have ever seen or heard of a mature individual spray painting any form of public property. Not restricted to race, religion or country, it is a manifestation seen around the world. 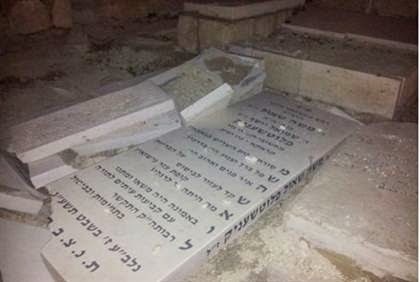 Desecrated Jewish graves around the world have been painted with swastikas, and I won’t recognize that horrendous action with a photo. 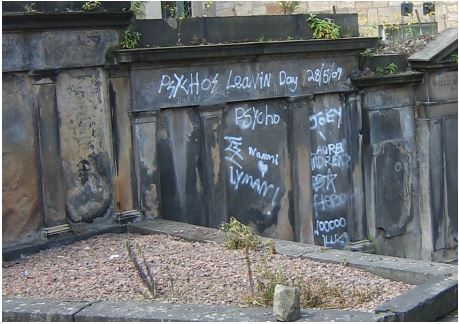 In the Old Calton Burial Ground in Edinburgh, Scotland, graffiti perhaps identifies the painter as a psycho. 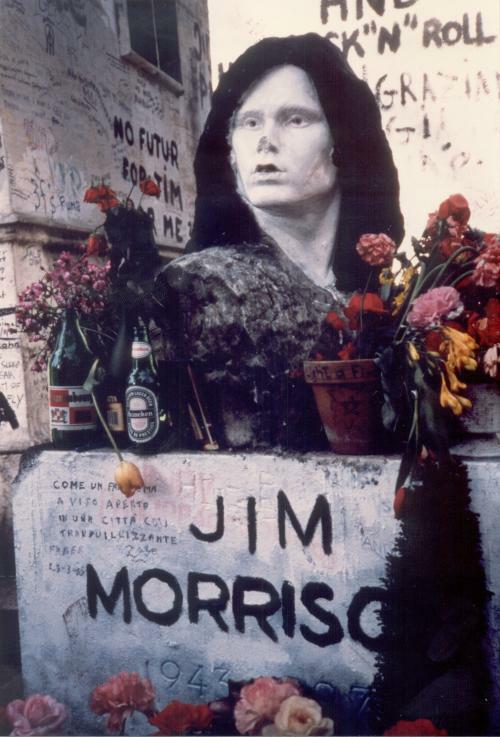 Graffiti on Jim Morrison’s grave in Pere Lachaise Cemetry, Paris, France. Visitors seem to think they have more to say than he did. 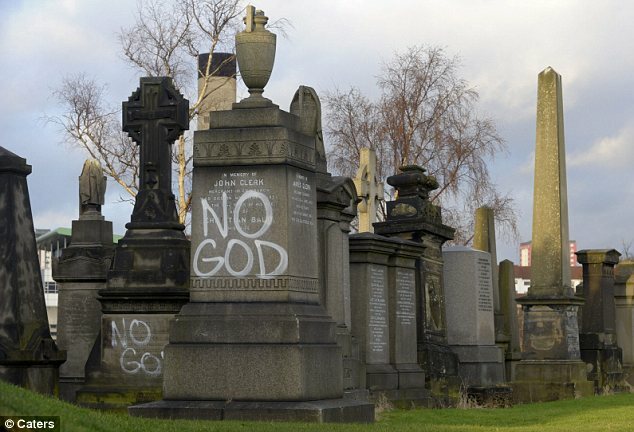 A grave in Glasgow Necropolis, Scotland, claims there is no God. In Singapore a despondent has inscribed a message of love. 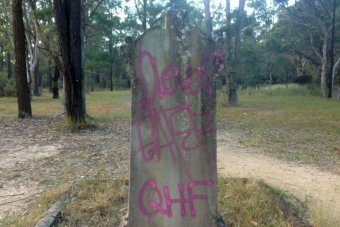 In the Sydney township of Castlereagh, Australia there is an isolated graveyard which provides graffiti opportunism. The First Fleet pioneers do not deserve such disrespect. 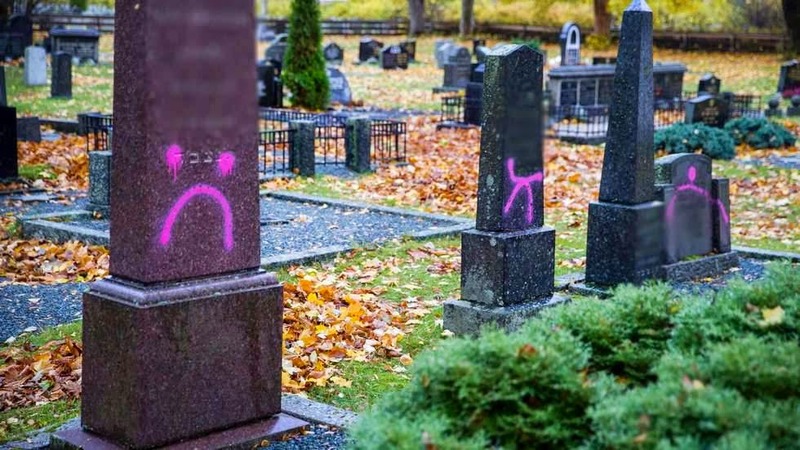 In Trondheim Norway, Jewish gravestones have been attacked with flamboyant pink paint. 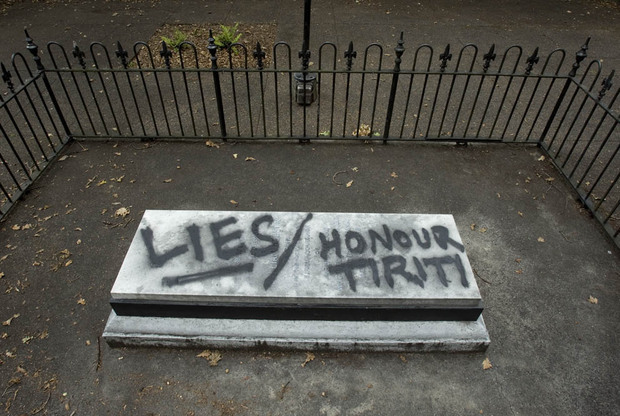 Graffiti on the gravestone of New Zealand’s first Governor William Hobson, at the Symonds Street cemetery in Auckland shows the disillusion of the vandal. The treaty which was signed in 1840 by representatives of the British government and various Māori ownership chiefs, recognised Māori ownership of their lands and other properties, and gave Māori the rights of British subjects. 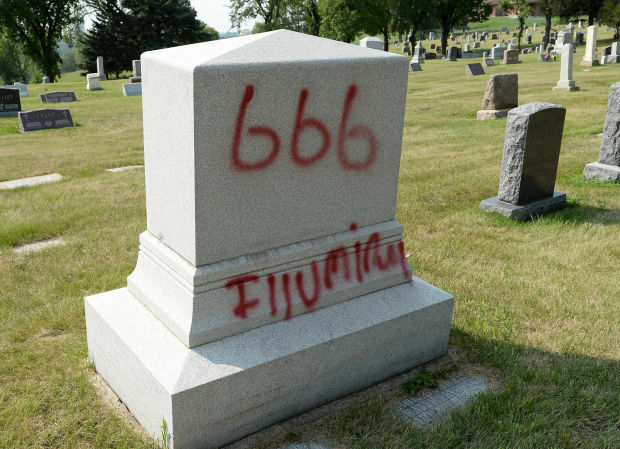 In St. Mary’s Cemetery, Bismarck, North Dakota, USA, a devil worshipper has desecrated a large memorial stone. 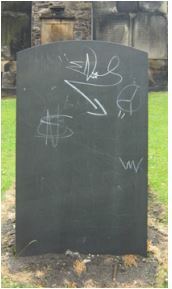 Desecration of physical memorials is not the only type of vandalism. Illegally drinking alcohol and doing drugs leaves the area littered with empty bottles and discarded needles. It’s sad and disgraceful that the memory of departed loved ones are so often vandalized and desecrated. The isolation and loneliness of cemeteries can leave visitors feeling unsafe which creates a catch 22 situation. An inscription on a grave in Milton, Ontario, Canada suggests: ‘The last enemy that shall be destroyed is death.’ I would suggest that the last enemy is vandalism. 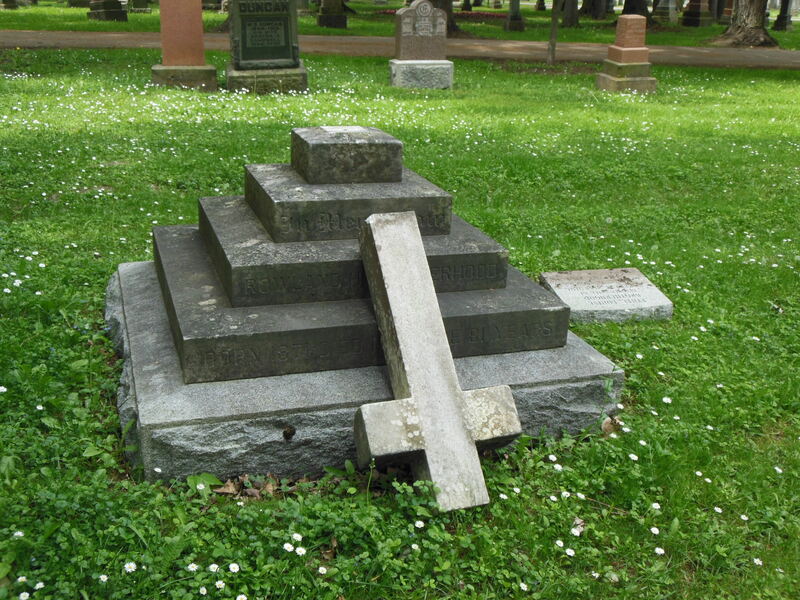 Would vandals be so eager to kick over the gravestone of their own mother or grandfather? Representing two cultures of contrasting architectures, these gardens are set on adjacent islands in Jurong Lake linked by the Bridge of Double Beauty. The Japanese Garden embraces classical Zen rock gardens, traditional summer houses, stone lanterns and gilded arched bridges. Plain and serene, it is intended to evoke feeling. Marble-chip paths let you hear your own footsteps and meditate on the sound. The Chinese Garden features twin pagodas, arched bridges, pavilions, rockeries and a bonsai garden. Brightly colored buildings are integrated with the surroundings. 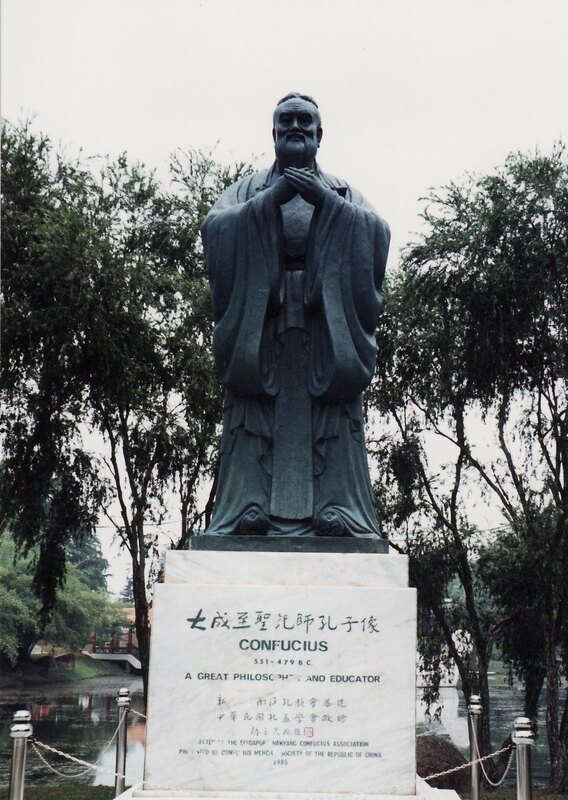 The statue of Confucius is located in the Chinese Gardens. Parents bring their children to the statue to pray as this is thought to bring filial piety and good grades at school. We should keep the dead before our eyes, and honor them as though still living. “The Master said, At fifteen I set my heart upon learning. At thirty, I had planted my feet firm upon the ground. At forty, I no longer suffered from perplexities. At fifty, I knew what were the biddings of Heaven. At sixty, I heard them with docile ear.